WINNIPEG, Manitoba/NEW YORK (Reuters) - A U.S. judge in Montana has blocked construction of the Keystone XL pipeline designed to carry heavy crude oil from Canada to the United States, drawing praise on Friday from environmental groups and a rebuke from President Donald Trump. 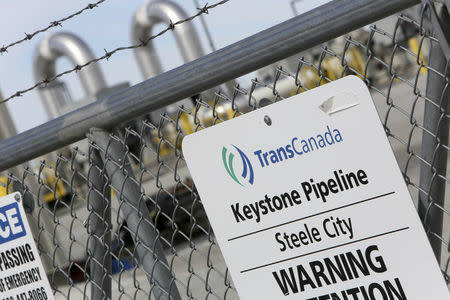 The ruling of a U.S. Court in Montana late on Thursday dealt a setback to TransCanada Corp, whose stock fell 1.7 percent in Toronto. Shares of companies that would ship oil on the pipeline also slid. The ruling drew an angry response from Trump, who approved the pipeline shortly after taking office. It also piles pressure on Canadian Prime Minister Justin Trudeau to assist the country's ailing oil sector by accelerating crude shipments by rail until pipelines are built. Clogged pipelines have made discounts on Canadian oil even steeper than they were earlier this year when Scotiabank warned that they may cost the country's economy C$16 billion. U.S. District Court Judge Brian Morris wrote that a U.S. State Department environmental analysis of Keystone XL "fell short of a 'hard look'" at the cumulative effects of greenhouse gas emissions and the impact on Native American land resources. "It was a political decision made by a judge. I think it's a disgrace," Trump told reporters at the White House. "The Trump administration tried to force this dirty pipeline project on the American people, but they can't ignore the threats it would pose to our clean water, our climate, and our communities," said the Sierra Club. Shares of Canadian oil producers Canadian Natural Resources Ltd and Cenovus Energy lost 2.7 percent and 2.2 percent respectively. "You have to wonder how long investors will tolerate the delays and whether the Canadian government will intervene again to protect the industry," said Morningstar analyst Sandy Fielden. Ensuring at least one pipeline is built is critical to Trudeau's plans, with a Canadian election expected next autumn. "I am disappointed in the court's decision and I will be reaching out to TransCanada later on today to show our support to them and understand what the path forward is for them," Natural Resources Minister Amarjeet Sohi told reporters in Edmonton, Alberta. "We're giving away our resources cheap," she told reporters. "We need market access." "People have placed quite a lot of hope in that (Keystone) project, so it's a major setback," she said in an interview. Morris, in his ruling, ordered the government to issue a more thorough environmental analysis before the project proceeds. He said the analysis failed to fully review the effects of the current oil price on the pipeline's viability and did not fully model potential spills and offer mitigation measures.